Sleep also plays a role in test performance, but in two unexpected ways. 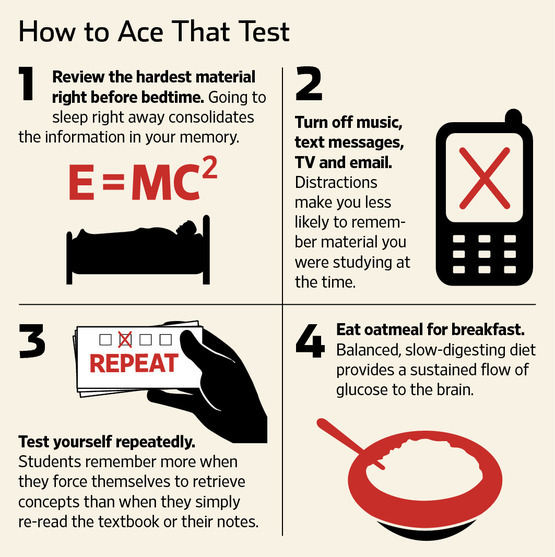 Review the toughest material right before going to bed the night before the test. That approach makes it easier to recall the material later, says Dan Taylor, director of a sleep-and-health-research lab at the University of North Texas in Denton. And don’t wake up earlier than usual to study; this could interfere with the rapid-eye-movement sleep that aids memory, he says. If you are still feeling anxious, set aside 10 minutes beforehand to write down your worries, says Dr. Beilock, an associate professor of psychology at the University of Chicago. She and a fellow researcher tested 106 ninth-graders for anxiety before their first high-pressure exam, then asked half of them to spend 10 minutes writing down their thoughts right before the test. The anxious kids who did the writing exercise performed as well on the test as the students who had been calm all along. But anxious students who didn’t do the writing performed more poorly. Expressing one’s worries in writing, Dr. Beilock says, unburdens the brain. « How do siblings shape your personality?